Many patients note wrinkles around the eyes, forehead and face. There are many methods used to address the patient’s specific problems. The method chosen is individualized to the patient. Traditional blepharoplasty and brow lift surgery will often not remove the fine wrinkles noted in these regions of the face. Other methods used to soften these wrinkles include: BOTOX injections, chemical peels and Laser Skin Resurfacing. BOTOX is a toxin which blocks the neuromuscular junction causing paralysis of the effected muscle. Injected in minute amounts very precisely into the muscles causing the wrinkles, BOTOX can temporarily smooth these wrinkles. The effect often lasts only 3-6 months and the injection is repeated at that time. Laser Skin Resurfacing is a relatively new method to treat wrinkles. It acts much like a chemical peel but is more uniform. The eyelids are integral in facilitating the normal functioning of the eye. As such, the eyes are thoroughly examined. A thorough medical history and ophthalmologic history is taken with note taken of any previous eye diseases and/or surgery. Because our physicians are trained in Ophthalmic Plastic surgery and Ophthalmology as well, we are uniquely qualified to evaluate and perform this type of surgery. A biomicroscopic examination is performed to assess the ocular surface, the propensity for dry eye formation is evaluated and eyelid function and form are examined. Specifically, the laxity of the lids, the amount of eyelid closure, the position of the lid crease, the eyelid excursion and the position of the lid margin in relation to the eyeball are noted. History of previous skin disorders, skin type and skin pigmentation are noted. The use of Accutane in the previous year, dark skin types and active facial herpes infection are contraindications to laser resurfacing. If a patient is judged to be a good candidate, the patient is often pretreated with skin conditioners such as Retin-A and started on antibiotics and antiviral medication preoperatively. If only one or two segments of the face are to be treated, the procedure can often times be done under IV sedation or local anesthesia in the office or outpatient surgery facility. When the entire face is treated, patients are treated under general anesthesia or IV sedation in an outpatient surgery facility. Frequently, patients are asked to arrive 1-2 hours prior to surgery. This allows the nursing staff to draw appropriate lab work, start an IV and answer any further questions you may have. An anesthesiologist will discuss anesthesia prior to surgery and answer any questions you may have. The surgery lasts between 30 minutes to an hour and a half. Laser eye shields are placed in the patient’s eyes prior to surgery. It is imperative that patients understand and are vigilant about their postoperative care. Instructions will be given to you prior to leaving the facility after surgery. Hydrogel dressings will be applied at the end of surgery and lubricating ointment will be applied to all treated areas which can not be covered by the Hydrogel dressings. The dressings are changed twice daily and the face is washed with a dilute soap at each dressing change. All treated areas not covered by the dressing are kept moist with a lubricating gel – Vaseline. Oral Antibiotics, Antiviral medication, Steroids and pain medications are taken as directed. Patients are evaluated between postoperative days 3-7. Any unusual scarring, crusting, redness or bleeding must be brought to the attention of your physician immediately. In general, after one week the dressings may be discontinued and the skin kept moist with a lubricating ointment – Cetaphil lotion. It is imperative that no sun exposure occur during the first several months postoperatively. 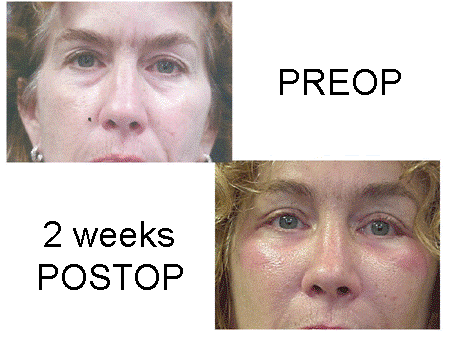 Complications are uncommon with Laser Skin Resurfacing. Because the procedure essentially “burns” the tissue, the postoperative care regimen is vital in obtaining a good result. Any crusting, unusual redness, scarring, infection or bleeding must be immediately brought to your physician’s attention. The most common complication is redness. This generally lasts 1-3 weeks. It is replaced by hyperpigmentation which is commonly treated with a topical bleaching cream. It is not uncommon for the hyperpigmentation to last 3-9 months. Other pigmentary abnormalities can be noted including hypopigmentation and patchy pigmentation. Scarring is rare but is known to occur at the jaw line and in areas of scabbing. This can occasionally be treated with topical or subcutaneous steroid injections. Infection is rare but can be significant and severe.